Mrs. Swan’s first book, ‘American Cut and Engraved Glass: The Brilliant Period in Historical Perspective’ sold over 18,000 copies. The book is no longer in print but continues to be the “bible” for both new and advanced collectors of American Brilliant cut glass. When Mrs. Swan passed on in 2007 at age 94, she had already begun to compile information and photos for her second book. This, which will be her second book, is a compilation of magazine articles written by her for various ‘collecting magazines’ between1983 and 2004 and is being published by her family in her memory. Most of the articles cannot be found in The Hobstar, monthly newsletter of the American Cut Glass Association. 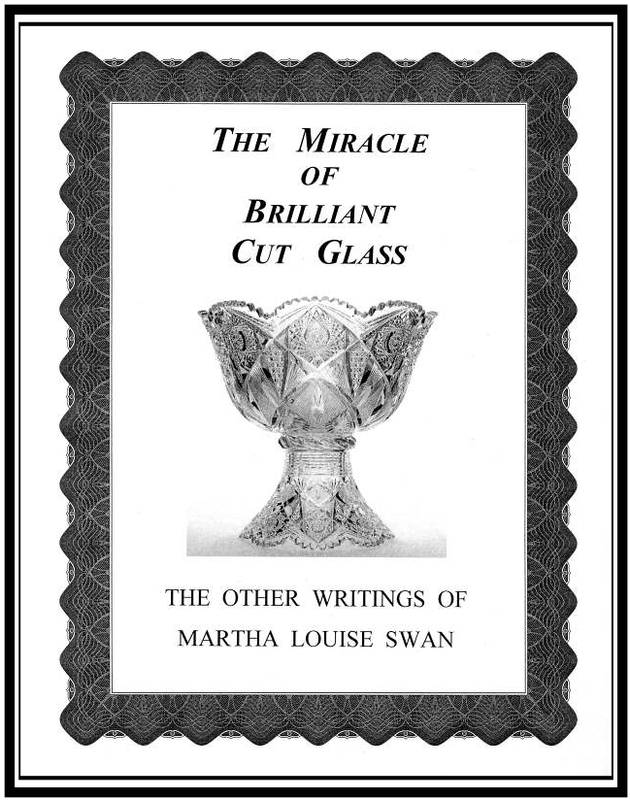 The book contains over 220 pages which include thirty-one articles (many with several photos of cut glass), selected photos of glass accumulated for her second book, previously unpublished photos of glass from her personal collection, four of her poems and ‘remembrances’ by her daughter Noreen. The magazine articles were generally about a single subject, i.e. Cut & Engraved Baskets, Jugs, Lamps, Decanters, Comports, Celeries, Canadian Glass, Engraved Glass, Napkin Rings, Salts, Cut Glass for Invalids, Fake Glass and Silver-Mounted Glass. The book is available for immediate shipment and the price of $15.00 per copy includes media postage to any address in the United States.